Description: The Rescue Center features 4 levels of fun: 1st floor Fire Station, 2nd floor Squad Room, 3rd floor First-Aid Station, and 4th floor (roof) Heliport with a helicopter landing pad. 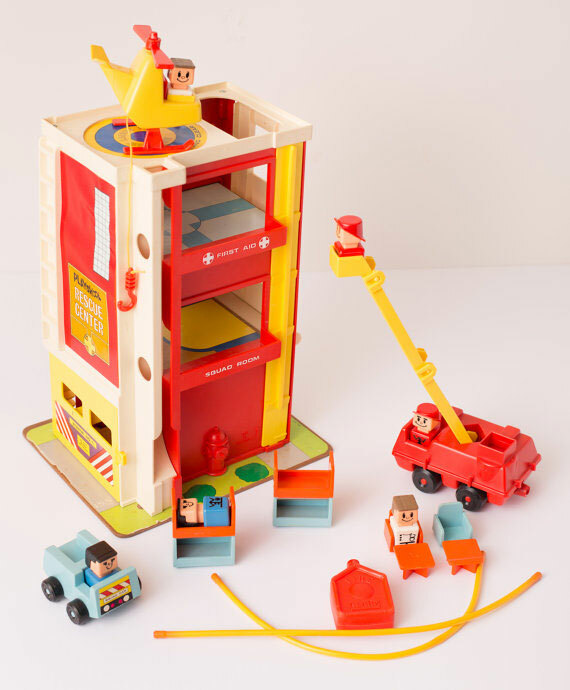 The set includes a fire truck with water hoses and rescue ladder/bucket, a Fire Chief's car designed to catch the Chief as he comes down his chute on the Rescue Center base, and a helicopter with a cable and sky hook (hook lowers as rotor turns). A Rescue Cage (which doubles as an elevator) attaches to the hook and can be lowered through the roof hatch (opening) into the 3rd floor First-Aid Station. Also includes 6 figures, bunkbeds, chairs and small tables. PSKB470 - Rescue Center - Tall red and white plastic building with a rectangular masonite base. The 1st floor Fire Station has a large yellow door that swings open (door marked "Engine No. 1"). Inside has a yellow floor/ramp: the back lifts upward via yellow push button on side out building: the tilt make the fire truck roll out when stored inside. The white back wall of the rescue center has a 2-story fold-down ramp (allows access inside the 2nd floor Squad Room, 3rd floor First-Aid Station). The 2nd floor has 1 large window on the right side, and an open balcony marked, "SQUAD ROOM" in white. The 3rd floor has 2 small windows on the right side, and an open balcony marked, "FIRST AID" in white. The white roof has a round helicopter landing pad and an open rectangular hole (hatch door) to drop down into the 3rd level. One corner of the roof has a square open hole to drop figures down the chute running down the side of the building. Base Litho - The rectangular masonite base has a litho of green grass, bushes and sidewalk. Part of the green area has small black text marked, "No. 470 ©1973 Playskool Inc., Under Berne & Universal Copyright Convention". Fire Station Door - Rectangular litho with red/white stripes on the edges and black triangular center design. Center has 2 yellow blocks with black text, one marked, "ENGINE NO. 1", other marked, "DO NOT BLOCK DRIVEWAY". Litho fits on exterior side of 1st level yellow door. 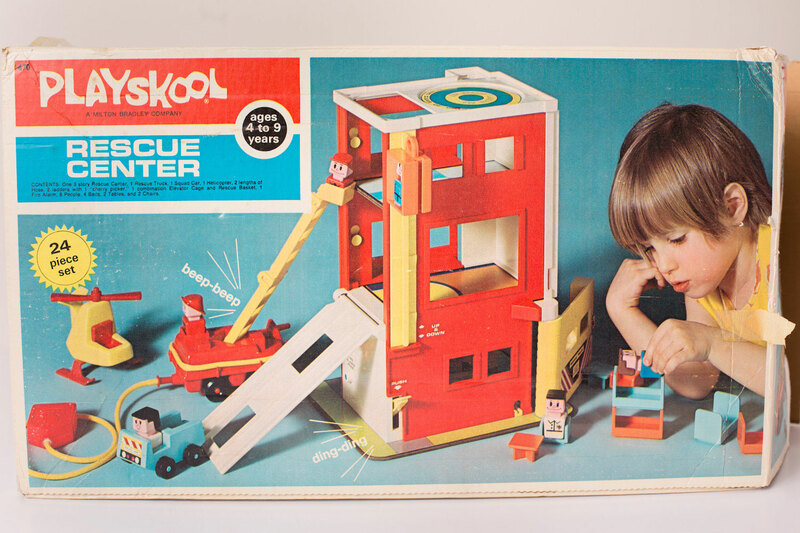 Front Wall - Large red rectangular litho with an orange square marked "Playskool" in black and "RESCUE CENTER" in white. Top right corner of litho features a window with small square panes. Litho fits on front exterior wall above the 1st level yellow door. Squad Room Floor - Blue retangular litho (covers masonite floor of 2nd level Squad Room). Has a yellow U-shaped area near the front and an orange area near the back. First Aid Floor - Light blue retangular litho (covers masonite floor of 3rd level First Aid). Has a blue cross shape with a circle within the cross area. Helicopter Landing Pad - Round litho with blue and yellow rings. Marked, "AIR RESCUE LANDING PAD", and, "STAND CLEAR OF ROTORS". Litho fits within round recessed area of roof top. Rescue Cage (doubles as an elevator on the Rescue Center base) - Rectangular block with a rectangular recessed area on 2 sides and a round hole in the middle (to push figure out when placed in recessed area). The top has a loop with a hole in the center (for the helicopter hook to fit into), and the 2 long outside edges have a squared recessed groove (to attach to elevator track on the Rescue Center outside wall). See variations below for color options. PSK80 - Yellow hose with red plastic water nozzle on both ends. PSK81 - Yellow hose with red plastic water nozzle on one end and a red squared pumper on the other end. The pumper has an imprint marked, "FIRE ALARM". PSK82 - Fire Truck - Small red squared fire truck with 2 square "seats" on top, a square in the top center (for ladder attachment), small pegs on the edges (to attach hoses to fire truck edges), and rolls on 4 black wheels (marked Playskool) held on via red plastic rivets. Fire truck has a peg on the back (to attach fire hoses). 2 each - PSK83 - Fire Truck Ladder - Yellow plastic 4-rung ladder with 2 round connectors (each with a male peg in the center) on one end and with 2 rounded connectors (each with an oval-shaped hole in the center) on the other end. The connectors allow 2 (or more) of these ladder pieces to connect together. PSK340 - Fire Truck Ladder Basket - Yellow square ladder basket with 2 round connectors (each with a male peg in the center) on one end (to connect to the PSK83 ladder). PSK84 - Fire Chief Car - Small light blue squared car with 1 square front seat and a rectangular flatbed in the back. The front has a litho marked "SQUAD CAR". Rolls on 4 black wheels (marked Playskool) held on via light blue plastic rivets. PSK85 - Helicopter - Small boxy yellow helicopter with a red 2-blade propeller (rotates) on top and 2 red landing skiis on bottom. Has 1 square seat with a red backrest. The helicopter has an attached rope with a plastic hook attached. The hook lifts/lowers as the propeller spins. 4 each - Beds - Rectangular single bed with a tall headboard and footboard (allowing the beds to stack into bunk beds). When flipped over, the beds can also be used as tall tables. See variations below for color options. 2 each - End Tables - Small square table with X-shaped legs on the bottom. Bottom of tabletop marked, "351912". Measures 1-5/16" x 1-5/16" tabletop x 3/4" tall. See variations below for color options. 2 each - Chairs - Small square chair with arm rests on 2 sides, a tall backrest, and a small square raised outline base. Bottom of chair marked, "351911". Measures 1-3/8" wide x 1-1/8" deep x 1-5/16" tall (backrest). See variations below for color options. Featured in 1974 JcPenny Christmas Wish Book (page 321) - price $11.77. Featured in 1976 JcPenny Christmas Wish Book (page 360) - price $9.77.